There's some impressive tech here and Basis has nailed many of the bugs that used to plague the Peak. It still feels too expensive for what it delivers, though. Slim design despite presence of HR monitor. Handy smartphone notifications. Impressively detailed tracking of your life. Unreliable heart rate monitor. Little context offered for all the data it collects. Less useful as a running/cycling/gym companion. UPDATE: The latest news on the Basis Peak is that it now comes with free access to the Runtastic Pro app (usually £4/$5) plus the offer of a 40% discount on Runtastic Premium membership. This gives access to unlimited Runtastic training plans and advanced fitness analysis. The Basis Peak already works with several popular, third party run- and cycle-tracking apps but this is the first time a premium version has been offered. However, as with its Strava and Endomondo tie-ups (see 'Running and exercise tracking'), this only involves adding the Peak's heart rate data to the third party GPS tracking and fitness analysis. It does not allow that data to be sucked back into Basis' app. 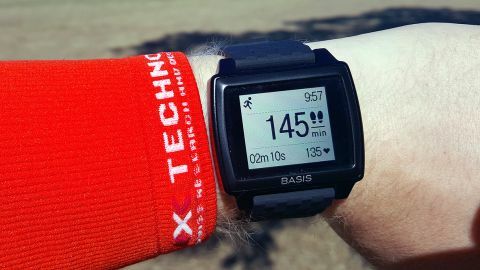 Basis is a part of Intel and we reviewed its second fitness tracker, the Basis Peak, compatible with iOS and Android or desktop PC or Mac, back in December 2014. The Basis Peak was, in many ways, an improvement on its predecessor, the Basis B1 Carbon Steel, boasting a thinner metal body and a redesigned heart rate sensor. It also had, for the time, a very large number of sensors measuring everything from temperature to galvanic skin response and perspiration levels. It was, however, a bit of a mess, with questionable heart-rate tracking, no GPS, despite a number of features that suggest it could have been a competent running watch, and data that was plentiful but not useful. Since then, the likes of the Fitbit Surge and Garmin Vivoactive have moved into the same space as the Peak, with their mix of fitness tracking, more advanced run tracking and smartwatch-like features. Basis, to its credit, has provided a number of firmware updates since, adding smartphone notifications and trying to address the the issues that we, and other users, had with the Basis Peak. For that reason, we're revisiting this interesting hybrid of smartwatch and fitness wearable. It remains expensive at $199 or £170 (about AU$233). The question is whether this hybrid wearable is now worth that money. The 1.25-inch touchscreen is maybe not out of the top tier but is still generally easy to read and has a scratch-resistant sheet of Gorilla Glass 3 to protect it. Charging the Peak is via the simple magnetic cradle seen above. It's a less painful than the clamp-on one used with the B1. One of the most striking improvements of Basis Peak over the Basis B1 is a considerably improved design. Gone are the thick and bulky plastic body of the B1, replaced by a sleek, aluminium chassis. Thanks to the new metal case, the wearable feels sturdier and much more premium compared to the original. The watch is also just as water resistant up to 5ATM, letting you dive into depths as deep as 40 meters - or 131 feet.The Peak also improves on the activity tracker's overall proportions, shrinking the Basis B1's embarrassing thickness to a noticeably sleeker device. Turn the watch over and you'll find the Peak's revamped heart rate monitor which sticks out from the bottom of the watch with a small hump housing two very bright LEDs that scan your pulse through your skin. The wristbands - one in white with grey accents, one black with a red underside - that come with the Basis Peak are made of comfortable, flexible and stretchy, soft silicone. In short, the Peak, though it won't win beauty contests, is very comfortable and perfectly wearable. Oh, and if you don't like the supplied bands, they can be easily popped out and replaced with any 23mm wrist band.